A day with Jim Sinegal, the Merchandising Maestro who gets shoppers to buy 2,250-count packs of Q-Tips and mayo by the drum. (Fortune Magazine) -- A man who looks like Wilford Brimley moseys into the Costco warehouse store in the Seattle suburb of Issaquah, Wash., on a bright Columbus Day morning, easily blending into the throngs of shoppers picking up Cheerios, toilet paper and cashmere sweaters. But as soon as Costco CEO Jim Sinegal crosses the threshold of this vast, 150,000-square-foot theater of retail, it's abundantly clear that he's not just a spectator - he's the executive producer, director and critic. "Jim's in the building!" crackles over the walkie-talkie of warehouse manager Louie Silveira. In the apparel section, Silveira's infectious grin morphs into a look of slight panic. Price-sensitive: Sinegal loves breaking retail rules. Costco sells more efficiently than its low-margin peers. It even outdoes plusher names like Nordstrom, and holds its own against higher-markup "category killers" like Best Buy. A sudden hop in his step, Silveira, who can log 15 miles a day walking the aisles, scurries over to Sinegal. Unsmiling, hands in his pockets, a coffee stain on his $12.99 Costco shirt, Sinegal turns out to be a no-nonsense connoisseur of detail. He greets his manager with a barrage of questions: "What's new today?" "We just moved this $800 espresso machine to an end-cap," Silveira responds, meaning he moved it out from the middle of the aisle to a more prominent location at the end. "What did we do in produce last week?" Wielding a bar-code scanner like a six-shooter, Silveira answers each query to Sinegal's satisfaction, but evidently that's not often the case. "When he starts looking at an item too long," Silveira confides later, "I say, 'Oh, s***.' "
Sinegal makes a beeline for a table full of $29.99 Italian-made Hathaway men's dress shirts, located just off the "racetrack," which is retail lingo for the U-shaped path along the perimeter - down one side, across, and back up the other side - that most shoppers follow upon entering the warehouse. He takes a shirt out of the box, fingers it, ponders a moment then puts it back. He walks away, but soon returns to the table. He looks concerned. In keeping with Costco's low-price, limited-selection philosophy, the Hathaway shirts are all the same size - a 34/35-inch sleeve. Today, at least, if you want a more precise length, you're out of luck. "I'm anxious to see how it does," says Sinegal, bending to pick up a bit of trash off the floor. Sinegal needn't worry. The shirts, like everything else at Costco (Charts), will no doubt sell out within days, to be replaced by another item in the company's carousel of ridiculously priced high-quality inventory. With $59 billion in sales from 488 warehouse locations, Costco, No. 28 in the Fortune 500, is the fourth-largest retailer in the country and the seventh-largest in the world. The company counts nearly 48 million people as members, and those customers are not only slavishly devoted (averaging 22 trips per year, according to UBS analyst Neil Currie), but surprisingly affluent as well (more than a third have household incomes over $75,000). While Wal-Mart (Charts) stands for low prices and Target (Charts) embodies cheap chic, Costco is a retail treasure hunt, where one's shopping cart could contain a $50,000 diamond ring resting on top of a 64-ounce vat of mayonnaise. Despite having 82 fewer outlets than its nearest rival, Wal-Mart's Sam's Club, Costco generates about $20 billion more in sales. Clearly, Costco is doing something right - but what? And how? To figure that out, we shadowed Sinegal, who has spent 52 of his 70 years in the retail business. 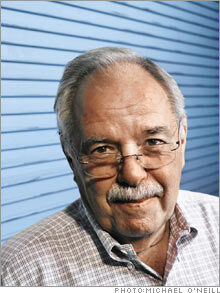 He got his start working for Sol Price, who created the warehouse-club format, and left Price to launch Costco in 1983. Over the years, he's become a merchandising grand master, an exceedingly shrewd practitioner of the unglamorous but elusive art of getting the right product in the right place at the right time for the right price. When Jim Sinegal told Sol Price that he was launching a warehouse club to compete with Price's own Price Club, "Sol was pissed," recalls Sinegal, sipping Starbucks coffee (black) in his modestly appointed office at Costco headquarters in Issaquah. Price had a point: His erstwhile prot�g� was now his top rival in the fast-growing warehouse-club business. Wal-Mart launched Sam's Club that same year; Price Club and Costco later merged, in 1993. And what a strange business it is. Costco refuses to mark up any item more than 14 percent, in contrast to supermarkets and department stores, which often carry markups of 25 percent and 50 percent, respectively. "We always look to see how much of a gulf we can create between ourselves and the competition," Sinegal says. "So that the competitors eventually say, 'F*** 'em, these guys are crazy. We'll compete somewhere else.' "
To illustrate, Sinegal recounts a story about denim. "Some years ago we were selling a hot brand of jeans for $29.99. They were $50 in a department store. We got a great deal on them and could have sold them for a higher price, but we went down to $29.99. Why? We knew it would create a riot." Low markups may create excitement, but they also mean lower profits: Costco ekes out pretax margins of around 3 percent. Despite the microscopic margins, Costco earned $1.1 billion last fiscal year through its membership fees - $50 per year of pure profit - and its spartan approach to costs. The company doesn't use pricey ad agencies. Products move right from the delivery truck to the charm-free concrete sales floor. Signage looks like it was made with a cheap laser printer. There are no commissioned salespeople. There aren't even any shopping bags. The only cost that Costco doesn't skimp on is wages and benefits, which are the envy of big-box employees nationwide. And yet Costco's card-carrying legions come in droves, waiting anxiously in fancy foreign cars on Saturday mornings for the store to open. Carts in hand, they display a fervor not usually seen outside of houses of worship. Why? Because we all love a bargain, and Lord help us if we miss one. "We only carry about 4,000 items," says Sinegal, "compared with 40,000 in a typical supermarket and 150,000 in a Wal-Mart supercenter. Of that 4,000, about 3,000 can be found on the floor all the time. The other 1,000 are the treasure-hunt stuff that's always changing. It's the type of item a customer knows they'd better buy because it will not be there next time, like Waterford crystal. We try to get that sense of urgency in our customers." The limited-variety approach isn't for everyone, though. Sinegal explains: "We carry a 325-count bottle of Advil for $15.25," he says. "Lots of customers don't want to buy 325. If you had ten customers come in to buy Advil, how many are not going to buy any because you just have one size? Maybe one or two. We refer to that as the intelligent loss of sales: We are prepared to give up that one customer. But if we had four or five sizes of Advil, as grocery stores do, it would make our business more difficult to manage. Our business can only succeed if we are efficient. You can't go on selling at these margins if you are not." The more efficient the product sourcing, the more latitude Sinegal can give his store managers in how they lay out those big bottles of Advil. "There are certain merchandise displays that all warehouses do," he says. "TVs are always in the front, for example. But the intent is not to tell these guys how to run their places. Our managers are entrepreneurs, not somebody who just comes in and unlocks the doors." Indeed, with some locations doing upwards of $300 million in sales a year, each warehouse is a mini-corporation, and each manager a de facto CEO. Costco differs from other retailers in many ways, but it's not as if Sinegal feels he has nothing to learn from them. "Whole Foods (Charts) has a lot of theater to it," he says. "It's difficult to walk in there and not buy something." He also learned a lot from Stew Leonard's, a supermarket chain in the Northeast: "When we did our fresh foods, we studied them closely." And Target: "They have high standards, but they do that without being boring. That's the trick." Sinegal has taken Costco where no warehouse club had gone before - pharmacy, fresh bakery and meat, store brands one could be proud to serve in the home and international expansion. Sinegal's son Michael is currently heading Costco's Japanese operations. Will he run the company someday? Sinegal won't go there. Being a CEO was the last thing on 18-year-old Jim Sinegal's mind when he took a job unloading mattresses at Fed-Mart, Sol Price's precursor to Price Club. "It wasn't that great a job," Sinegal recalls. "I was getting a buck and a quarter an hour. But it was exciting. Sol was a major part of that excitement. He was not big on compliments, but you never doubted what was on his mind. Ever. He was always able to discover everything we were doing wrong. He just had a knack for it." Price saw that the young Sinegal had the knack too, and chose him to overhaul Fed-Mart's flagship store. "When I was 26," Sinegal continues, "Sol made me the manager in the original San Diego store, which had become unprofitable. I was supposed to narrow down the selection and get out of troublesome categories like apparel. We had way too much apparel. So here I was, this kid, and I was given a tremendous responsibility. As a result of simplifying the process, we were able to get it back into the black." Sinegal embraced Price's iconoclastic approach. "An awful lot of what we did at Fed-Mart was counterintuitive to people who were in the merchandising business at that time," Sinegal says. "We didn't advertise or accept major credit cards. It was all self-service. Also, you had to be a member of the club. People paid us to shop there." Most counterintuitive of all was Price's stubborn refusal to wring an extra buck from his customers. "Many retailers look at an item and say, 'I'm selling this for ten bucks. How can I sell it for 11?' We look at it and say, How can we get it to nine bucks? And then, How can we get it to eight? It is contrary to the thinking of a retailer, which is to see how much more profit you can get out of it. But once you start doing that, it's like heroin." Sinegal works diligently to prevent that addiction from entering Costco's bloodstream. Now that he's in Price's role - retail sage - how does he impart what he's learned, and how does he know who his best students are? Step one is obvious: Hire smart young workers. "One of the first places we recruit is at the local university," Sinegal says. "These people are smarter than the average person, hard-working and they haven't made a career choice." Those who demonstrate smarts and strong people skills move up the ranks. But without merchandising savvy - that ability to know what product would sell best on an end-cap on any given Saturday - an employee has no chance to become warehouse manager. "People who have the feel for it just start to get it," says Sinegal. "Others, you look at them and it's like they are staring at a blank canvas. I'm not trying to be unduly harsh, but that's the way it works. They are not going to become a Louie." Back in his warehouse, Louie Silveira is perhaps wishing he'd become someone else. He's still facing an Issaquah inquisition from Sinegal, who's convinced he saw a digital piano - $1,999 at the Issaquah warehouse - priced lower in one of his Florida locations the week before. He's not sure which, but tells Silveira to track it down. Silveira checks on a few, but they are all priced the same as his. Sinegal isn't satisfied. The following day, after hours of boring budget meetings, Sinegal finds, to his delight, that the piano was indeed marked down to $1,499 in the Kendall, Fla., outlet. No victory is too small. "Every time you go someplace, you see something that excites you," Sinegal says. "I was just in the South of France, and there was this gelato stand. I could not believe the excitement it created. I haven't figured out how we will do it at Costco, but it's in my noodle." Jenny Mero and Dana Castillo contributed to this article.